Here in Rome I have adopted the phrase “a gelato a day keeps the doctor away”. Although the second part of this phrase many not be true the first part is absolutely accurate; I definitely eat a gelato a day. In my defense, between class, exploring and everyday life I usually walk around 5-10 miles each day in the hot sun so snacking on a nice cold gelato or two doesn’t seem all that bad. Since my first day here in Rome I have been searching for the best gelato; the complete package. The complete package must involve the perfect flavor, the most beautiful presentation, and the most reasonable price. I fell in love with my first gelato in Florence and let me tell you, I thought I had found my other half in gelato form! The flavor was mint. But this mint wasn’t just your average mint chocolate chip tub from the grocery store, this mint was so smooth it melted in your mouth. So that was a check off the perfect flavor category. The presentation was adequate but I’d seen better. The gelato came in a small cup, very average looking with a small little cookie on the top. Cute… but not beautiful. Also the price was a little too high; I’d seen lower. So I hadn’t found the whole package but I was still on the hunt. Later that week my roommate and I took the metro to a random stop and got off in search of gelato, of course. We stumbled upon this adorable little shop decorated in ‘70s style complete with a hippie van. I ordered chocolate chip. Wow. This gelato was so creamy and the chocolate chips added a small crunch. I was in love… but I wasn’t sure if this topped my mint gelato but it was tied for sure. The presentation was average, a small decorated cup, but no cookie on top. 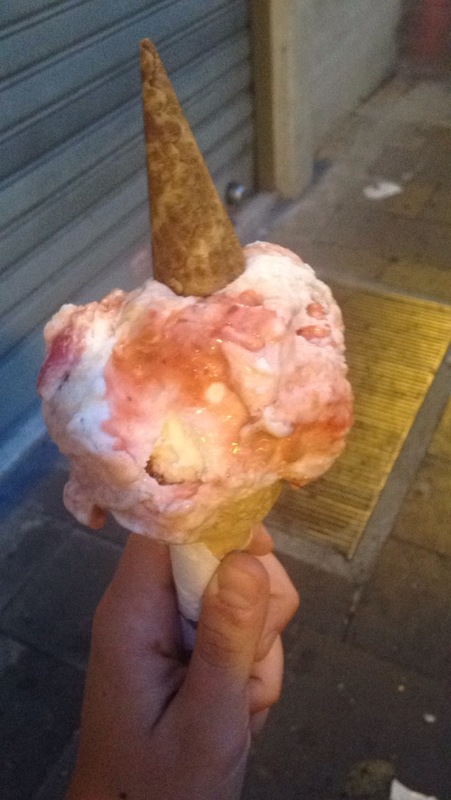 The price was 3 euro; definitely too expensive for the amount of gelato he placed in my cup. Nope, not the whole package, but this gelato was still in my top three. I wondered if I would ever top the mint. Several weeks later my friends and I went to try a new gelato shop near our dorm. I went, of course, but I really wasn’t expecting much considering the location of the shop. We walked in and paid and a small was only 2 euro. Great price. I walked up to the counter and examined all the flavors trying to decide. I decided on cheesecake. The man behind the counter put a huge scoop into my cone, much larger than other gelato shops, and put a small little baby cone on top, like a hat. The presentation was impeccable. I licked the cheesecake gelato and I’d found it. This gelato was the best thing I had ever tasted; it was like I had not only found my other half but a part of myself! I had found my gelato soul mate. The cheesecake has small pieces of the crust mixed in and strawberry flavoring drizzled over the top. Delicious! It tasted better than any cheesecake I’s ever had in my entire life, and I love cheesecake. Perfect flavor, check! Most beautiful presentation, check! Most reasonable price, check! ! ! Finding the perfect gelato was a very delicious challenge. I have felt great since I’ve been here in Rome and maybe my phrase “a gelato a day keeps the doctor away” is actually true! Although I do not believe anything could top my gelato soulmate I am always on the hunt. That’s my girl! Pretty sure that would be what I would be obsessed with in Rome, too! Miss you and love you!